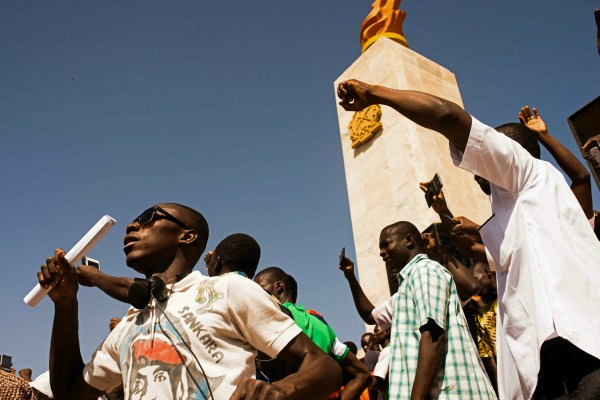 People gather at the Place de Nation to ask for a civilian and democratic transition, Ouagadougou, Burkina Faso, Nov. 2, 2014 (AP photo by Theo Renaut). On the morning of Oct. 30, 2014, throngs of protesters overwhelmed security forces in Burkina Faso’s capital, Ouagadougou, and burned the National Assembly building, physically preventing deputies from voting to further extend President Blaise Compaore’s tenure. That “popular insurrection,” as almost everyone in Burkina Faso now calls it, continued into the next day, driving the authoritarian president out of the country after 27 years in power.